Would they? Wouldn’t they? How could they? With the Academy of Country Music returning to Vegas for the 53rd annual ACM Awards, the org’s first since the terrible mass shooting at the Route 91 Festival, the notion of how to recognize the tragedy without exploiting the 58 killed and several hundred injured loomed large. 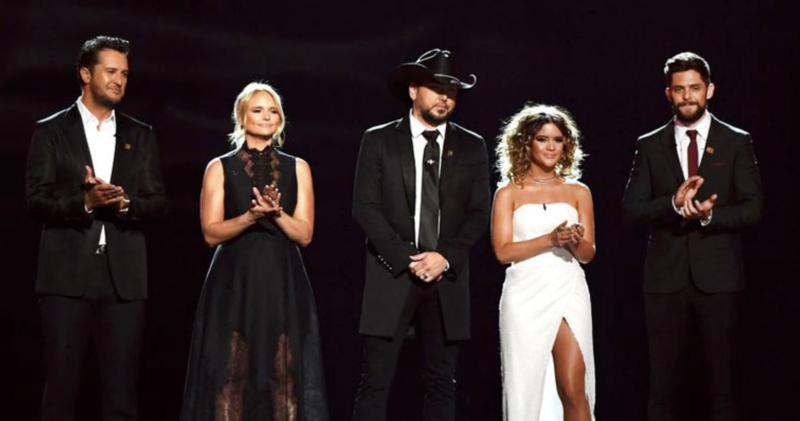 Joined by Miranda Lambert, Luke Bryan, Maren Morris and Thomas Rhett for a spoken-word open, they let their words land on the hearts of those assembled in the MGM Grand Arena. Sober but triumphant, producer RAC Clark and ACM head Pete Fisher successfully walked the line. Viewers liked it. The show, which aired on CBS, was the top program of the night, pulling in an audience of 12.1m. That was an increase of 1.2m viewers over the 2017 broadcast. With a killer monologue by hostess Reba McEntire, which pointed out that after several years of Blake Shelton, Luke Bryan and Dierks Bentley as co-hosts, one woman was now doing what it took two—or three—men to do plus a joke about the biggest thing in 1993 being McEntire’s hair, the show turned left and started achieving elevation in a respectful way. Whomever is writing McEntire’s material deserves kudos for a wry tone that could bring levity after such a heavy moment. Equally matched to the task was Kenny Chesney, alone on a flyer stage amongst the fans. The four-time Entertainer of the Year leaned into his brand new “Get Along” with a zeal that was equal parts loving life and outright joy. McEntire intro’d the song, saying it was a message for right now, and the notion of focusing on our similarities instead of the stridence and differences added a note of jubilance. 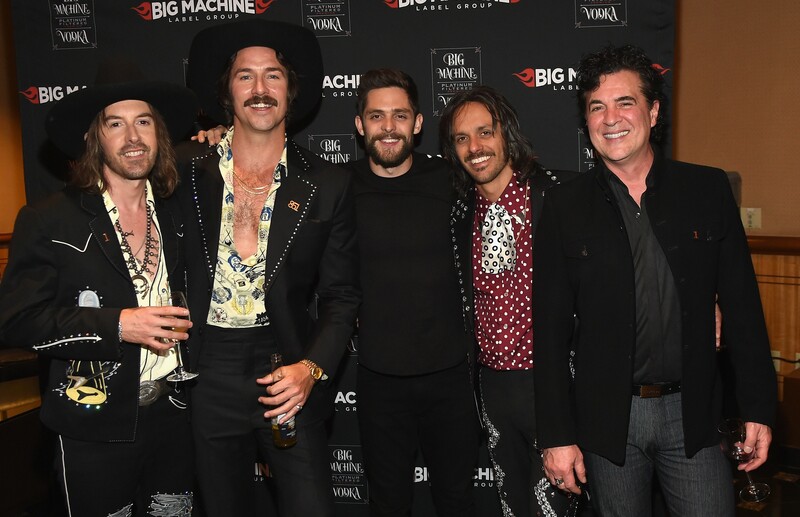 Big Machine boss Scott Borchetta toasts Midland and Thomas Rhett, whose mustaches all have their own dressing rooms. Without missing a beat, Morris—the female artist development story of the last five years—returned to the stage for a muscularly uptempo “Rich,” all sass and swagger. Then Chris Young followed with the more traditional-leaning “Losing Sleep,” suggesting there’s a place for classicism in the genre. Indeed, at a time when country has never been more pop, it was the throwback moments to celebrate 1993 that packed some of the evening’s biggest punches. Jon Pardi looked like the kid who got to take batting practice with Babe Ruth, sharing the stage with Alan Jackson on “Chattahoochee,” Shelton went toe-to-toe with Toby Keith on a loping “Should’ve Been a Cowboy” and Kelly Clarkson revved up the serious diva duet “Does He Love You” with McEntire. There were solid, classic performances from Aldean (the slow blues “You Make It Easy”), Keith Urban (the uplifting “Coming Home” with awesome graphics and Julia Michaels), and Bryan (humanity-affirming “Most People Are Good”). If former classmates Kane Brown and Lauren Alaina’s set looked like Stonehenge takes the beach, the performance of the erotically charged “What Ifs” speaks for a post-modern future for the once redneck genre. But Carrie Underwood pulled off the performance of the night hands down with “Cry Pretty.” Not only was the note she held at the end superlative for its clarity and emotional charge, her command of the stage and the song’s intention made the young woman wearing what appeared to be an evocation of Whitney Houston’s Bodyguard “Queen of the Night” dress transcendent. The sustained ovation at the end was almost as long as “that note,” and it was deserved. Beyond the performances—22 in all, there were winners. In some cases, Chris Stapleton taking Album and Male Vocalist, Lambert repeating as Female, and Brothers Osborne repeating as Duo of the Year, the awards were as expected. Aldean, who’d been onstage when the shooting happened, took Entertainer in the night’s most emotional win, and Old Dominion—oddly not performing, though in attendance—were easily the night’s most grateful winners. 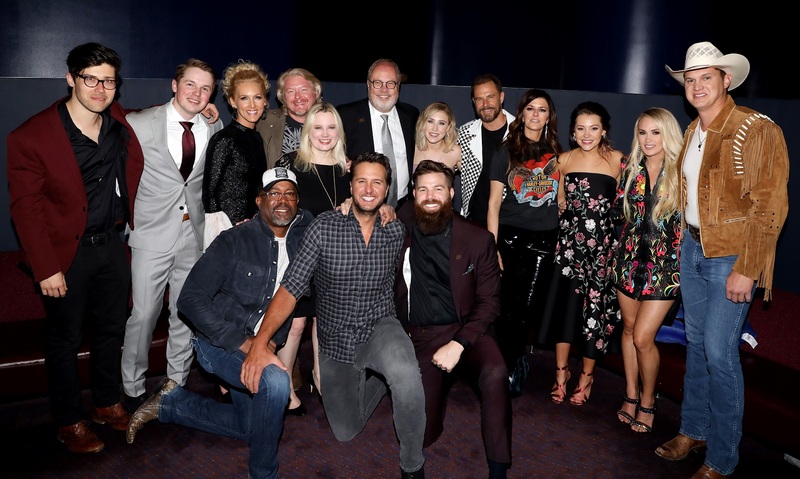 Urban and Underwood won Vocal Event for the surging “The Fighter,” a song about equanimity in a relationship, while Sam Hunt’s “Body Like A Back Road” took Single, but failed to prevail in Song, which went to Lambert’s “Tin Man.” The trio of Best News went to Brett Young, Alaina and Midland . As general takeaways go, there were a few. Jackson is the new Merle Haggard, Keith’s rough country sets him apart for his grittiness; the soon-to-be elder statesman still have “it” and have no trouble bringing the serious magic. Urban continues stretching the boundaries, but most progressively truly scans as a feminist. Sam Elliott is a killer ACM presenter, as is Entertainment Tonight’s Nancy O’Dell. Dead spiders appear to be the new trend in false eyelashes. Dan & Shay have a lock on Rascal Flatts’ real estate based on their very acoustic “Tequila.” McEntire should be hired in perpetuity for spirit, ability to capture the moment—coming onstage after Stapleton’s Album win to tell America the missing vocal powerhouse and wife Morgane had had their twins (“little rascals”) a little early. McEntire—who shouted out designer/former stylist Sandi Spika—was also able to wear the plugging and once controversial “red dress” from her original “Does He Love You” performance in 1993. With Lambert breaking Brooks & Dunn’s record of 29 with Album and rounding 31 wins with Female, it was a big night for the Texan. It was also a big night for the Academy, which weathered a horrible tragedy without allowing it to capsize or overwhelm its annual awards show.